A Walk’s As Good As A Hit” is a collection of hilarious and occasionally poignant essays about a son’s attempts to avoid becoming his father. With wit and candor, the author tackles timeless topics – grades, girls, family vacations – of family discord. 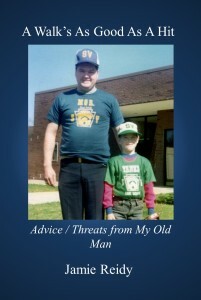 Eventually, Reidy realizes becoming his old man isn’t the worst thing that can happen to him.